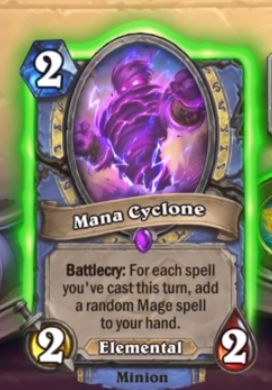 Mana Cyclone is an Epic Mage minion that belongs to the Elemental tribe. The reveal from Disguised Toast was quite epic this time. Most streamers have received the same puzzle box to solve in order to get the card they are supposed to reveal. Toast just broke and smashed his! A recap with the rest of today's reveals can be found here. That's actual pretty good, if you can use it with a cheap twincast spell it's already paying for itself, and it's an elmenental. I like this card. In wild, it'll make quest mage even more consistent. For other deck, it can revive some kind of spell-synergy tempo deck as it was some time ago with flamewalker. I like it.